I love every single piece in this look and am already inspired by all the ways I’m going to make them work within my fall wardrobe. 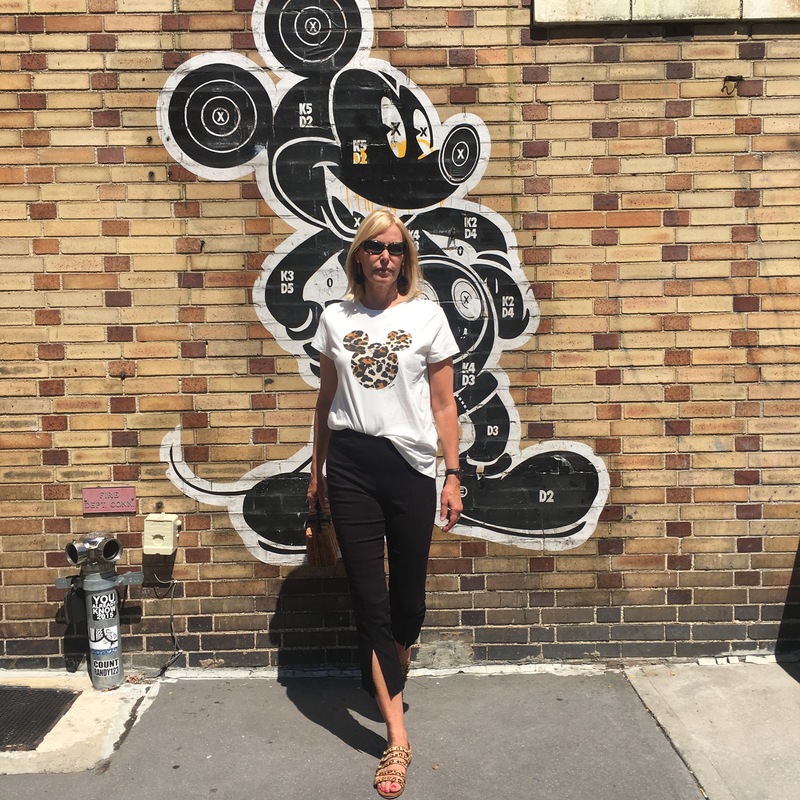 In full disclosure, the pants and sandals were shop-my-closet specials and featured in this post and this post. Again, another example that selective shopping, even if inspired by a trend, can give you years of wear without ever feeling “so last year.” I actually think I bought these leopard sandals over 5 years ago! For this shoot, I had a lot of fun mixing very tailored, versatile pieces (blazer, pants) with a whimsical tee, adorable bag and fierce sandals. 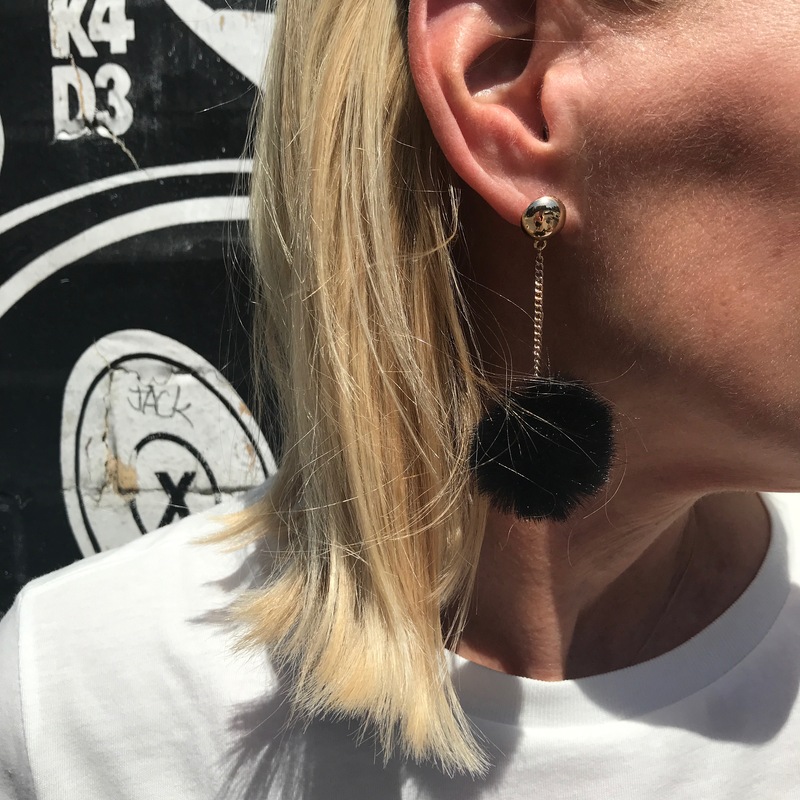 Oh…and furry pom pom earrings. And this street art was not planned! It was a happy discovery we chanced upon while shooting this post. I think Mickey would approve, don’t you? So let’s start at the top with this feminine, fitted tuxedo-style blazer. Yes, it’s a Zara score. (Damn you, Zara.) I swear that store never disappoints. In fact I sometimes have to set an off-limits break…or I’d break the bank! Honestly, this jacket looks and feels like a million bucks but costs under $100. It’s incredibly well-finished and has just the right touch of stretch. All in all, a wardrobe winner that I will be reaching for again and again. These front slit flares have been a favorite from Day One and for good reason. They were over-designed and under-priced…yay! And they dress up or down like nobody’s business. Which means I can wear them with complete confidence and ease to a client presentation in NYC or out to a jazz club or local JC restaurant for date night. 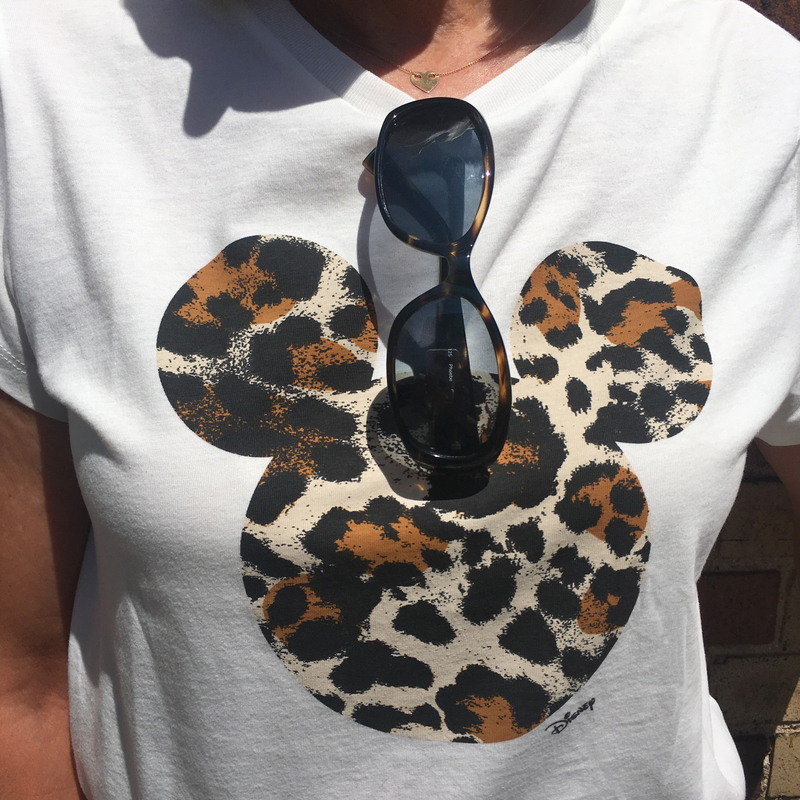 I’m not Disney obsessed, but I am obsessed with this tee. Cute, chic, comfy. LOVE. And speaking of obsessed, how about his adorable bag? 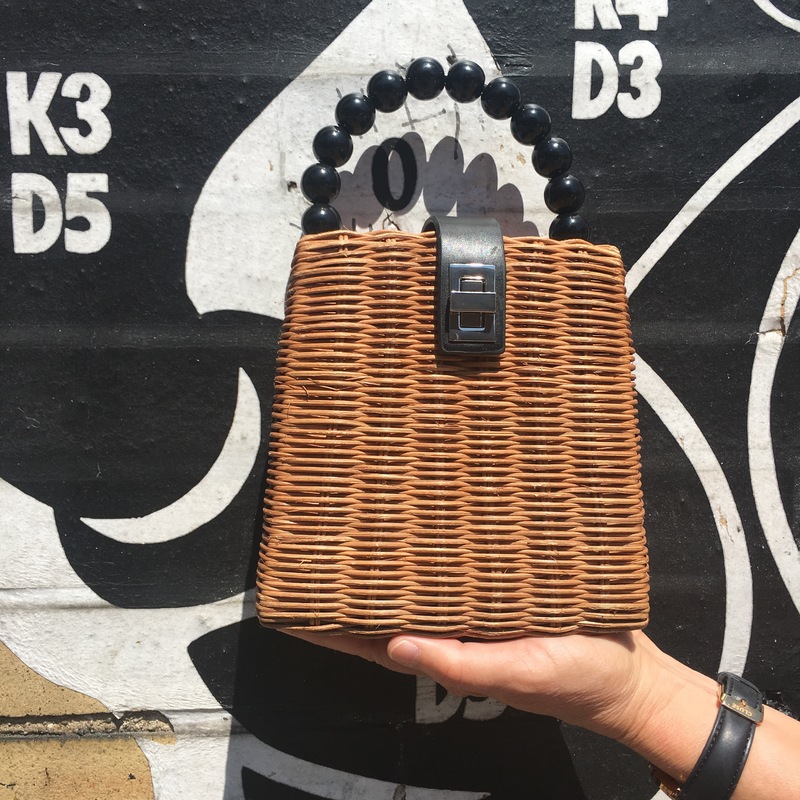 I love that it’s a darker rattan that will work all fall long, plus its beaded handle checks off that trend in a more subtle, timeless way. As in, it will still be perfect come next spring. Fair warning: this leopard-inspired look is probably not going to be my last one. I know, I know. But if you’ve never indulged your wilder side, I hope you might now. I promise you’ll be pleasantly, and purr-fectly, surprised by the pop it brings to your current wardrobe. Blazer: (Zara) Also like this and this. Pants: (old, WhoWhatWear x Target) but here’s another great affordable version. Tee: (H & M) Other fun variations here, here and here. Bag: (Zara, also in black). Loving this and this too. Sandals: (old) But how this mule and this bootie. Earrings: (old, Zara) Similar here and here.